It is the time of year when I start to notice cleaning jobs around the house which have been neglected over the winter months. I was recently contacted by the lovely folks over at Astonish to see if I would like to run a competition with them, so how could I say no? Astonish are a British family owned manufacturer of cruelty free cleaning products. Floor cleaner – with the smell of fresh sea mist this cleaned really well and left a lovely smell which freshened the kitchen. Oven & Cookware cleaner – I found this ideal for using on my hob, it has never looked this clean and no smears. Grease lifter – great on the underside of my frying plan, it does what it says on the box. Window & Glass cleaner – one of my pet hates is cleaning windows, streaks drive me funny but this cleaner is really good and smells pleasant too. Fabric refresher – a must being a doggy household, it smells gorgeous. I have a Good Clean Summer cleaning pack to give away. The pack contains a selections of cleaning products that are Vegetarian Society approved and registered with the Vegan Society. If you would like to win a Good Clean Summer please complete the rafflecopter form below. Good Luck. The Lime and Bergamot Floor Cleaner would be useful- I have all hard flooring in my flat at the moment and it can be tricky to keep clean. The Astonish 4 in 1 disinfectant spray with a pine fresh scent would be great for me because I like on bottle to carry around with me to do lots of different surfaces. The laundry whites booster tablets would be very useful. The mould and mildew remover for our shower room. The stain remover bar to get those stubborn stains out of my daughters clothes. the DAILY SHOWER CLEANER would be very handy. The mould remover for around the bath would be very handy! The oven and cookware cleaner - we can never get our oven clean! The Oven and Cookware cleaner might motivate me to give my ovens a deep clean. The oven and cookware cleaner - it might help me keep the oven clean!! The mould and mildew remover - very useful for the grouting in the shower. Oven & cookware cleaning paste, my oven is in need of a super duper clean. My oven seriously needs the Oven Cleaner! Probably Oven and Cookware Cleaning Paste, as fiancé uses cooker, though not great at cleaning it promptly after use. He does have arthritis in his hands so it may be his physical condition which causes difficulty. CARPET & UPHOLSTERY TARGET SPRAY would be ideal for me as I am constantly scrubbing mud and chocolate off! The Laundry Whites Booster Tablets would be a big help for the laundry. I think the Oven and Cookware cleaner would be most useful. It would help me with one of my least favourite jobs. Floor cleaner in my kitchen! The anti-bacterial spray - I use it every single day in one way or another. Ohhh, I wonder when this will be available in Australia? The Oven & Cookware cleaner would be the most useful to me I think. The Astonish Pro Hob Cream Cleaner - my hob is in desperate need of a decent clean! The mould and mildew remover. It would be so useful in our bathroom, especially as we're preparing to move. I like the 4 in 1 Disinfectant Spray as use a lot of it after cleaning up after our cat! I love how these products are cruelty free! The Mould and Mildew remover sounds great, perfect for the shower! I'd find the window and glass cleaner most useful as we've got 2 showers that need cleaning often. Oven & Cookware Cleaning Paste - I've used it before and it's fabtastic! 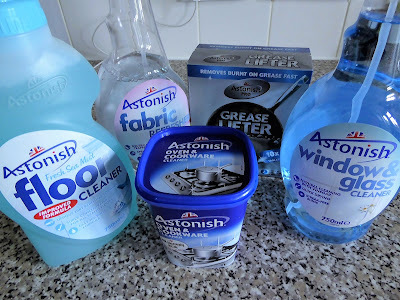 I really hate cleaning the oven but have used the Astonish Oven and Cookware Cleaning Paste and it is non messy and brillient for getting the grime off,especially the glass door so this would be my choice. The Ultimate Limescale Remover would be great to try, I live in a hard water area so limescale is a big problem. Pro Grease Lifter Tablets would be a great use in my kitchen! The Astonish carpet & upholstery target spray :) We have a cat, and he has a few accidents from time to time so it would definitely be helpful! I think the 4 in one disinfectant spray for me, as it would be so versatile! The antibacterial cleaner would be very useful. the dustbuster everyone need one of those! The fabric refresher would come in handy with the curtains and sofas for a little freshening up. The Astonish Mould & Mildew Remover would be great for the bathroom. The Mould and Mildew Remover would be fab for our bathroom! The carpet spray sound s great! The anti-bacterial cleaner woudld be really useful for us. the cookwear cleaner would be so useful! The mould and mildew remover because we are moving into a new house that has a lot!! THE CARPET & UPHOLSTERY TARGET SPRAY -VERY USEFUL WITH 2 KIDS & 3 CATS! The Oven and Cookware Cleaning Paste would be brilliant. The antibacterial spray. Can never have enough! The stain remover target spray as its perfect for our busy home. the stain remover target spray! My 4 year old son starts primary school in September so the Oxy plus stain remover would be extremely useful. The fabric refresher, it smells lovely ! Astonish limescale preventer as I'm in a shockingly hard water area here. The astonish 4 in 1 disinfectant spray looks like a great multipurpose cleaner and could really be handy around the house. I want to try the uPVC Cream Cleaner as I've heard it's really good but I've yet to get my hands on some! The window & glass cleaner. We have a sliding door into our conservatory & the Grandchildren always put sticky hands all over it! The descaler limescale remover would be really useful for me as my iron and kettle are full of limescale. The window and glass cleaner, as I'm terrible for getting streaks, so this should help me a bit! The OXY Plus stain remover. Having 3 young children I get lots and lots of stains on their clothes to deal with. This would be very useful. The window and glass cleaner would be great as we seem to get through lots of it. I'd say The Astonish tile & grout restorer as it's a horrible job to tackle. The stain remover target spray - my little ones are always getting marks on their clothes! Mould and Mildew Remover would be great for me to deep clean my bathroom with! The mould and Mildrew remover for our bath! The oven cleaner power spray would be useful as ours could use a good scrub! I would like the white booster tablets as I like my whites to stay bright white. Love the look of the white booster; I've yet to find a product that really works! Would love to hear suggestions! The Jasmine & Orange flower non bio Laundry Liquid, the laundry would smell gorgeous. the stain remover as my daughter is weaning! The Oven & Cookware Cleaner, I hate cleaning the oven! The 4 in 1 disinfectant spray as it can be used anywhere and everywhere. The oven and cookware cleaner because my oven really needs some tlc!